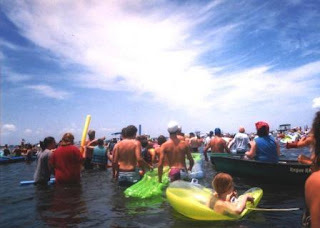 Today was the annual Freedom Swim across the Peace River (Charlotte County, Fla.). As I sit and write this, I can't believe what I went through today. In the middle of the river, I thought I was going to die. Well, that's a little dramatic but I did think I was going to get washed out into the Gulf of Mexico and perhaps end up in Cuba. Despite it all, I finished (although I had some help), am glad I made the swim and am considering doing it again next year. I showed up at Fishermen's Village with my floating raft thing and met up with LB, her husband and two daughters. We rode the trolley over to the beach area north of Gilchrist Bridge and waited for instructions. The goal was to swim to Fishermen's Village. Instructions weren't really instructions, it's a "freedom" swim, but was warned the past two years' swims have been easy and today would be difficult because of the tide and current. The man in charge (I assume he's in charge, think I saw him on TV the other night) said it was best to swim up then over vs. over, due to the current. Have I told you this is a 1.5 mile swim? Although, one of the swimmers on the trolley said it's really 1.75 miles. Not sure if this was a good sign or not. Shortly after leaving the shore and swimming upstream, a big dead fish floated by. Yuck! I tried to keep up with LB et al but I let the boats get in the way. (The boats, including kayaks, were out there spotting people and giving a little help when needed.) And other swimmers. 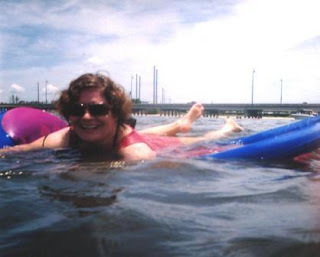 I tried doing the backstroke on my raft thing, but couldn't keep up. I decided to just go with the flow and at my own pace. I kicked, paddled and stroked but didn't seem to make any headway. I soon thought, "What did I get myself into?" The swim reminded me of some of the stupid things I've done in my life, like the time I went skiing in Yellowstone, alone, and almost falling off a cliff (a tree saved me then) or walking the streets of New Orleans, alone, and befriending the homeless. Yup, this swim was not going well. But, not giving up (I had no choice) I kept on going, trying to swim forward, keeping a positive attitude. But no matter how much I kicked and swam, Fishermen's Village still looked far away. I looked behind me to see orange, lime green and lemon yellow noodles bobbing up and down with little wet heads in the center. At least I wasn't at the end of the group. I passed by boats resisting to ask for help but then the wake kicked up and into my nose and down my throat. I HATE drinking sea water! It's not just the salty taste but the fishy aftertaste that grosses me out. My mind raced and I decided I would just drift back towards the bridge and hope someone would pick me up before I was swept out into the Gulf. But help came before I was swept into the Gulf. A fishing captain came by, using a trolling motor. "You okay?" He called out. Letting pride get in the way, "Are you moving or am I drifting back?" I replied. And the boat moved on but common sense kicked in when I saw four teenagers floating behind the boat. "Is he giving tows?" I asked. I grabbed the kid's hand and he pulled me to a loop in the line. I have no shame, I was saved! I was going to make it to the other side. 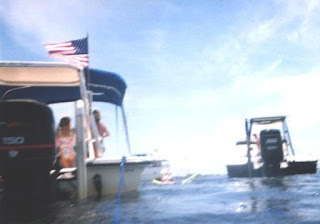 While being dragged behind the boat, I noticed others were being towed behind other boats, too. Marine patrol, the police and even the tow boat was picking up weary swimmers. The boat captain's wife told me the current is really bad this year and she had to be towed her first year. Suppose she was trying to make me feel better. Didn't matter to me. I was saved! Turns out the captain placed in the 2008 Oh Boy! Oberto Redish Cup. Unfortunately, although I was staring at his name painted on the back of the boat, I can't remember it! Captain Jim something. A strange thing happened to my body soon after I grabbed the line. It got weak, really weak. My calves and feet had cramped up and my arms felt like rubber. My toes and fingers turned to little prunes. Other than saving my life, the ride gave me a chance to bond with my new neighbors. I learned about the local high school baseball scene and some of Charlotte County's early settlers. I bobbed along, feeling like a barnacle latched onto the rope, enjoying the scenery when I heard, "Jenn! Jenn!" It was one of LB's daughters! LB's husband and daughter were bobbing along. Long story short, we picked them up. We stayed latched to the line as close to the ladder up to Harpoon Harry's as long as possible. It still meant we had to swim 50 yards or so. We saw LB and her other daughter getting out ahead of us. When I reached the ladder, my legs were wobbly like Jello. A man grabbed my raft thing and I somehow pulled myself out. I was tired, heavy with sea salt and hungry. Fast forward to tonight. As I sit writing this, my legs and arms are still sore. My face, head and shoulders are red from sunburn. Although I've showered, I can still taste the salty Peace River. Even after it all and having been towed in, I still feel accomplished. Next year I can do it, with the help of a personal flotation device and some flippers. I'll add photos to this post tomorrow. I didn't take my digital but a disposable waterproof one and will need to scan the images in . Stay tuned! Another note about today, it would have been my 10th wedding anniversary. Where has the time flown? Wow! What an adventure! I'm glad you got a tow before your body got too weak. It's interesting how we don't realize most times like this just how far we've pushed ourselves. What fun, though! Sounds like a great annual event! That's quite a story. I think I'll pass on that one...I'm not a big fan of sharks. I suggest using a kayak next year. It wasn't Captain Jim Passmore was it? That would be way too small world if it was! People who try to do something like this should definitely wear AquaJogger belts or at least life jackets or something... you'd be surprised how many people will underestimate how tired swimming such a long distance will make them!